Dates: 31 March [O.S. 21 March] 1685 – 28 July 1750. 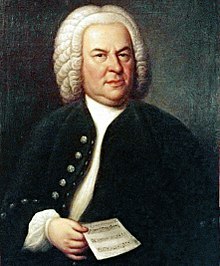 168152Johann Sebastian BachJohann SebastianBachBach,_Johann SebastianBach.jpg16851750en:Johann_Sebastian_BachCategory:Johann Sebastian BachDates: 31 March [O.S. 21 March] 1685 – 28 July 1750. This page was last edited on 12 November 2018, at 09:38.